Centerpointe for Children truly wants to support your child and family as you navigate through your occupational therapy experience. There are tons of links below that will provide you with more information about research, community and our favorite therapeutic tools. Happy clicking! As part of the Ayres Sensory Integration® 2020 vision, the international Goal Leadership Team – Sensory Integration Global Network (SIGN) is aiming to publish 100 research papers that further the understanding and evidence for Ayres Sensory Integration® (ASI). Click here for an incredible compilation of research articles, with more being added! Does My Child Have a Sensory Issue? 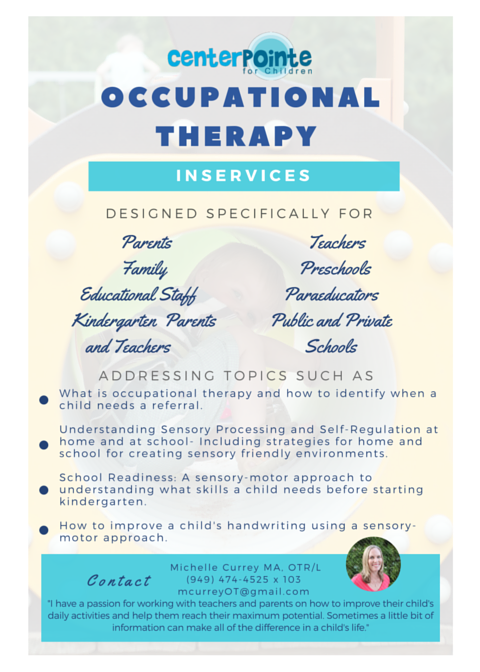 How Occupational Therapy Helps with Sensory Integration Issues? What is the Proprioceptive System? Passport to FUNction – a website/blog promoting and teaching therapeutic park play through videos, sensory integration education, and good ol’ fun! FUNOrangeCountyParks.com – Looking for a park with shade? Family friendly walking paths? Splash parks and water play? This website/blog is the ultimate local park resource. Best Day Foundation – a program built around adventure water sports including kayaking, stand up paddling, body boarding, tandem surfing and more! Sign ups are limited and sells out quickly! Surfer’s Healing – surf camp! Sells out incredibly quickly so plan ahead for summer fun! Open Sky for Autism – gearing up for a vacation? This program is a simulated experience of experiences at the airport and flight. © 2016 Centerpointe for Children. All Rights Reserved.